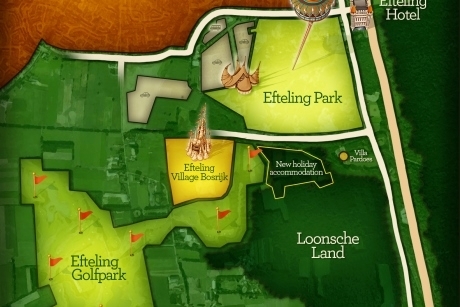 Efteling theme park, in the south of Holland, is investing €30 million (around £22 million) to construct a new holiday village, which will open in early 2017. The new accommodation will boast central facilities and holiday homes designed to be more compatible with the district’s natural surroundings. The site, which is more than eight hectares in size, will border the theme park and be based between Efteling Golf Park and the Loonsche Land nature site. The new holiday village is part of the park’s plans to expand from a regional park into a short break destination with five million visitors per year by 2020. Preparation is already underway, with the first guests expected to be welcomed in early 2017. Once the new accommodation opens, Efteling will offer a total of 3,000 beds: 450 in the Efteling Hotel, 1,550 in the Efteling Village Bosrijk holiday park and a further 1,000 in the new holiday village. Efteling theme park was opened in 1952 and has since welcomed more than 120 million visitors. The fairy tale attraction is known to be one of Europe’s biggest theme parks, as well as one of the oldest in the world. The park boasts natural surroundings, having largely been built in an existing pine tree forest located in a rural area. Each element of the attraction is based on elements from ancient myths, legends, fairy tales, fables and folklore. Efteling also produces its own television series and programmes such as Fairytale Tree, Fairytales and My Dad the Magician. The park offers plenty of benefits for school trips, such as discounted entry, catering, and a printable educational programme from its website. For more information visit www.efteling.co.uk. Keeley Rodgers catches up with Paul Curnow, Form Teacher & Forest School Leader, after he was given the LOtC Inspiring Educator Award for his work.